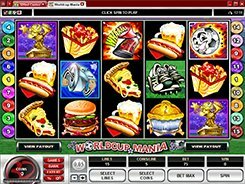 World Cup Mania is a Microgaming-powered slot with 5 reels and 15 paylines. 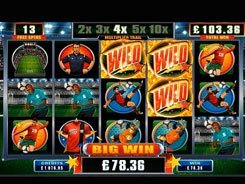 The theme of the slot revolves around football, with detailed graphics and visually appealing symbols that include fast food sold at stadiums, football boots, trophies, fog horns, and referee whistles. A coin size is adjusted from a penny to $1, with up to 5 coins accepted per pin. So the floor and ceiling bets are $0.15 and $75 with all win lines activated. The Ball is a wild symbol that can substitute for other non-feature icons. 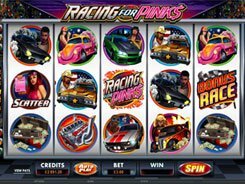 Besides, two to five wilds pay out x5 to x7500 times a line bet. 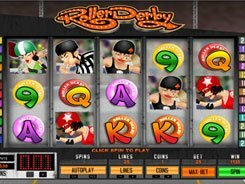 The Referee Whistle acts as a scatter, with three or more unlocking ten free spins at a x3 multiplier. There is also a bonus feature known as the Free Kick Bonus and triggered by 3+ Gold Trophies on an active payline. 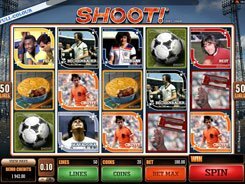 The Free Kick Bonus is played on the second screen where you should make three to five kicks at the goal choosing a direction of your shot. 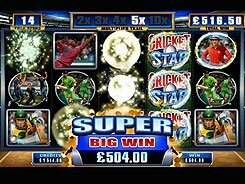 Every kick awards a random coin amount that can vary from x12 to x500 your line bet. PLAY FOR REAL MONEY!